Although formally a member of the Eastern Partnership (EaP), unfortunately Belarus does not participate in any of its programmes. It is excluded from visa liberalisation, the EaP flagship initiatives, and bilateral track programmes: for example, the Small and Medium-Size Enterprise Funding facility with a €15m budget, or the Eastern Partnership Pilot Regional Development Programmes with an allocation of €75m. It is worth mentioning that for 2010-2013, in total around €350m have been set for the Eastern Partnership programmes. 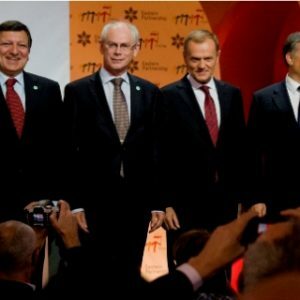 The Eastern Partnership programmes have been implemented since 2008, and during that time there has been a so-called period of liberalisation in Belarus. But civil society’s expectations of an improved situation have not been fulfilled. Minsk ignored the EU’s recommendations regarding democracy, the observance of human rights and an independent judiciary. Full cooperation with Belarus is impossible for Europe without political changes and the release of its political prisoners. Because Belarus does not participate actively in any of the EaP initiatives, it does not receive any of the resources from the EU that are designated for the development of the Eastern Partnership. Belarus is losing great opportunities. As a result resources go to the other five partner-countries within the EaP. In other words, others benefit from the opportunities lost by Belarus. The complex situation which Belarus is in has now been further complicated following the departure of European ambassadors from Minsk. The present conflict is a conflict of values which is difficult to resolve. It is the confrontation between the EU's commitment to a values-based approaches with regard changes in the country's, and the aspiration of the Belarusian authorities to retain absolute power and their wish to get different bonuses from their foreign partners. The Belarusian authorities impudently wanted to threaten the EU and make it reverse its position on sanctions. However, the effect was the inverse: Europe has shown solidarity and was not afraid to say “no”. The following conciliatory statements of the Belarusian authorities testify that they did not expect such conduct from Europe. For the general public it is hard to be aware of the result of Belarus’ participation in the Eastern Partnership. It has not brought any evident benefit that could be seen by the people. At the moment Russia “supports” Belarus. The question is what Belarus will do when its “support” ends. Receipt of Russian financial injections means technological backwardness, poor management, and the decline of entrepreneurship, and it needs to be stopped. People should live according to their own minds and their own work, and not receive free money for making declarations of geopolitical love. The abolition of the visa regime with EU countries may be the most evident way to tackle such imbalance. That would enable Belarusians to actually experience Europe through something other than the lens of official propaganda. It would also entail better access to education: it would be easier to attract foreign specialists to the country. Though we cannot bring an extra sausage to every home in Belarus with the Eastern Partnership, we can pave the road to a better life in future. The question is whether the restrictive measures against Belarus are effective or not. Sanctions have done neither serious good nor serious harm. Everything has stayed as it was. But when the Western stream narrowed, the Eastern broadened. The necessary resources are coming from the East. Because of the sanctions, Belarus faces a geopolitical imbalance. The most negative aspect of sanctions is the inconsistency of their implementation. That was the case with the 12 conditions for engagement with Belarus demanded by the EU which were first presented in November 2006. In 2008 the number of those conditions was reduced to “democratic elections, the freedom of expression and of the media, and the freedom of assembly and political association” and periodically had been disappearing from the agenda only to “emerge” from time to time. It is high time that the EU developed a coherent approach to Belarus and stuck to it. There is no doubt that the best proof of the Belarusian authorities’ intentions to come to the negotiating table regarding cooperation would be the release of political prisoners. This would be a clear signal for everybody. In Belarus such a decision depends on the desires of the very few and that is why it can be made at any time. As for the Eastern Partnership, the main task of the National Platform of EaP CSF is to help interested civil society bring Belarus back to the European path, and implement European standards in daily life. For me, as for the national coordinator, it is important that we Belarusians use the opportunities offered by the Eastern Partnership. The EU Council of Ministers recently introduced new restrictive measures against Belarusian businessmen and 29 companies that allegedly support the Belarusian regime. It is the first time the EU added so many Belarusian enterprises to its ban list. European politicians expect that it will help release political prisoners in Belarus. But in practise, it may lead to further deterioration of the human rights situation in the country and cause long-lasting distortions in the Belarusian economy. Both adherents and opponents of sanctions agree that political prisoners should be free, but they view differently how to achieve this goal. While some experts emphasise the moral importance of sanctions, others believe that they are hypocritical and harmful. They think that the EU is losing its leverage in the country and forces its authorities and businessmen to deal more with authoritarian states such as Russia. The revised ban list introduced on 23 March the EU Council of Foreign Ministers consists of 243 people and 32 Belarusian enterprises. This EU decision followed the recent execution of Dmitry Konovalov and Vladislav Kovalyov convicted of a terrorist attack in the Minsk underground on 11 April 2011. The Head of the EU External Action Service Catherine Ashton declared that the EU wants Belarusian authorities to release and rehabilitate all political prisoners. This is the only significant condition that must be fulfilled in order to improve the relations between official Minsk and Brussels. 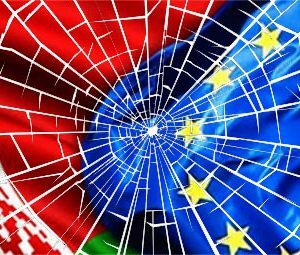 In response, the Belarusian MFA spokesman Andrei Savinykh stated that Belarus does not want to see the return of EU ambassadors of countries which supported sanctions against Belarusian. He notified European partners that now Belarus is forced to apply retaliatory measures, but he did not specify them. Poland-based Belarusian expert Pavel Usov thinks that sanctions are better than dialogue because the ultimate goal of the EU in Belarus should be the regime change. Therefore, the more pressure the better. Other proponents of sanctions believe that they will motivate the banned businessmen to convince Lukashenka to free political prisoners. Yuri Zisser, owner of the most visited Belarusian web portal Tut.By, believes that there is no evidence of involvement of the banned Belarusian businessmen in financing the regime. Zisser says that nobody knows the procedure of forming the EU ban list against Belarus and consequently EU officials may make arbitrary decisions on this matter. He also emphasised that European politicians do not want to spoil relations with Russia which is actually the main supporter of the Belarusian regime. Political scholar Yuri Shevtsov suggests that Russian or European businessmen might lobby EU sanctions against several Belarusian enterprises in order to buy them at a cheaper price during the process of privatisation. From his point of view, the majority of banned enterprises have no links with the regime and sanctions will lead to violation of competition rules and deterioration of the business environment. Former presidential candidate and economist Yaraslau Ramanchuk consider imposed sanctions as symbolic and ineffective. He thinks that banned businessmen Yuri Chizh and Anatoly Tarnavsky control a dozen of other companies that are not affiliated with them and they can easily establish new ones to avoid the sanctions. Russia May Be the Beneficiary of Sanctions? Previous week one of the opposition newspapers in Belarus leaked a document allegedly from the Belarusian presidential administration. This document unveiled possible reaction of Belarus to a new round of EU sanctions. Presumably the authorities are ready to leave the EU Eastern Partnership and introduce restrictive measures against European businesses in Belarus. Authorities have neither confirmed nor denied the authenticity of the document. Dozens of Belarusian opposition activists have already faced a ban from leaving the country, regardless of whether they supported sanctions or not. Alexander Lukashenka confirmed in his interview for Russia Today the existence of a ban list and hinted that it would be enforced "in full" in the future. Advocates of sanctions argue that they have a negative impact only on the banned companies and individuals. In fact, their impact is much wider as they increase risks for doing business in Belarus. In the near future European companies may refuse to work with Belarus because of the assumption that the EU may add their partners to the ban list at any moment. The reputation of all Belarusian companies suffers as well as the attractiveness of Belarus to foreign investors. This leads to higher interest rates for those Belarusian companies that want to obtain loans from European banks and institutions. Moreover, sanctions scare Belarusian and European businessmen away from the privatisation of Belarusian state property. Russian tycoons may cheaply get enterprises that particularly interest them with far-reaching political consequences for Belarusian sovereignty. Recently an opposition politician Viktar Ivashkevich asked European institutions to put an embargo on oil transit and cooperation with Belarusian oil traders. It is very unlikely that the EU will agree. Lithuania and Latvia have already expressed their reluctance to impose comprehensive economic sanctions against Belarus. Belarusian government protests against what they see as unfair treatment of Belarus by the EU – they see that such oil rich authoritarian countries as Azerbaijan, Kazakhstan and Russia do not face any sanctions despite very serious human rights violations. Critics question the moral importance of sanctions, because the EU did not impose them against several of Yuri Chizh's companies that participate in common projects with businessmen from Slovenia and Lithuania. It looks like gaining profit is a good reason for the EU to ignore moral considerations. Belarusian expert Andrei Schumann thinks that the EU-Belarus conflict reduces the sovereign status of Belarus to essentially that of Transnistria. It is a piece of land between Moldova and Ukraine which is recognised and supported only by Russia. Schumann fears that the country may soon lose its independence if the EU constructs a new Berlin Wall on the Western border of Belarus. Given that the EU visa policy towards Belarusian citizens is the strictest in the region with the highest fees, the Berlin Wall analogy seems appropriate. Talented Belarusian youth and well-qualified specialists continue to leave the country for education and work – primarily to Russia. As more opposition activists move abroad, the centre of opposition activities may soon move to emigration. To increase pro-European sentiments among the Belarusian population and stimulate democratic reforms in the country, the EU should invest more in the presence of European companies, institutions and NGOs in Belarus. The EU should also stop just focusing on inventing new sticks for the government completely forgetting the overwhelming majority of the Belarusian population. Europe should at the very least offer free visas for Belarusians and use other methods to engage the population bypassing the regime in Minsk.